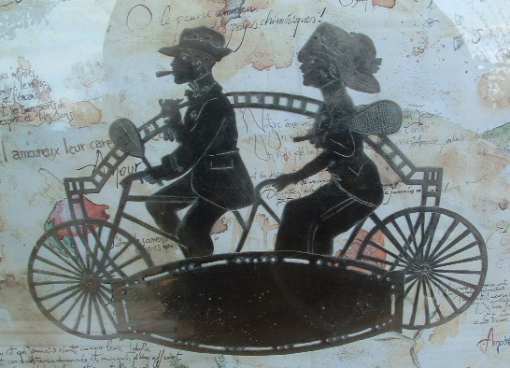 this is an antique metal silhouette representing a couple on a tandem bicycle with first '900 suits and tennis rackets. The silhouette is cut out by hand from a thin sheet of white metal and is of artisanal production. The metal is not silver but an alloy of other materials. I believe it's 'German silver' or 'alpaca', an alloy of copper, zinc and nickel discovered by a German industrial chemist E.A. Geitner in early 19th century. The silhouette has piercing and engraving on the figures and a wide reserve not engraved. I ignore its origin and use. In America, paper Silhouettes were highly popular from about 1790 to 1840. The invention of the camera signaled the end of the Silhouette as a widespread form of portraiture. However, their popularity is being reborn in a new generation of people who appreciate the Silhouette as a nostalgic and unique way of capturing a loved one's image. The name Silhouette traces back to the mid-18th century French finance minister, Etienne de Silhouette. Because his name was synonymous with doing things cheaply and because he was fond of making these images himself, this art form was named after him. This silhouette is 11 in. wide (cm. 28) and was bought from an Italian dealer in an Antique Market.